Deep vein thrombosis is a serious, but avoidable, condition with blood clotting in a vein deep within your body, usually in the lower leg or thigh. A greater threat of deep vein thrombosis is pulmonary embolism, when blood clots from DVT break away and move through the bloodstream to a lung, blocking an artery. A large clot, or multiple clots, can cause death. That’s why it’s so important to treat deep vein thrombosis at its earliest stages. Only about half of people with deep vein thrombosis actually experience symptoms, says the National, Heart, Lung, and Blood Institute. For 25 percent of people who die of deep vein thrombosis and pulmonary embolism, sudden death is the first symptom. A cramping sensation in the calf. Swelling or tenderness, often on one side, in the leg, ankle or foot. Severe, seemingly random, pain in the foot and ankle. Discoloration (reddish, bluish or pale) in the affected area. Signs of pulmonary embolism: Chest pain with a deep breath, shortness of breath, irregular heartbeat, low blood pressure, fainting or coughing up blood. If you experience any of these symptoms, call 911. A blood clot, or thrombus, in the deep veins in the arms or legs – those areas also have superficial veins closer to the surface of the skin – is potentially deadly. 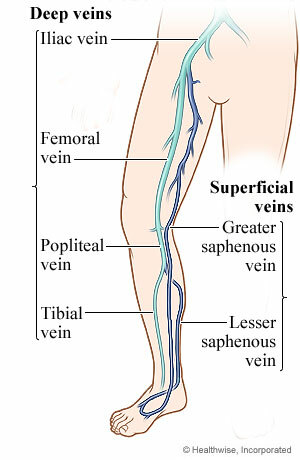 Lack of movement for prolonged periods is a primary contributor to deep vein thrombosis. It’s the reason people on longer airline or train trips (four or more hours) are urged to exercise their lower leg muscles to stimulate blood flow and help prevent the formation of blood clots. Pregnancy, including up to two months after childbirth. Trauma to the lower leg. Recent or continuing cancer treatment. A history of deep vein thrombosis. Conditions that can thicken blood or increase likelihood of clotting. A central venous catheter, a tube placed in the vein during medical treatment. Your doctor will consider signs of deep vein thrombosis (such as swelling or discoloration), your medical history, a physical exam and results of tests -- most likely including ultrasound -- before making a diagnosis. Once clotting has been identified, your doctor might prescribe medication to restrict the size of the blood clot, prevent it from breaking away and causing pulmonary embolism or to help prevent further clotting. Thrombin Inhibitors: Anticoagulants that bind to the enzyme thrombin, inhibiting its activity and preventing clots from forming. Thrombolytics: These drugs dissolve large bloods clots in an emergency treatment of pulmonary embolism (or heart attack or stroke). Because they can cause sudden bleeding, however, their use is restricted to life-threatening circumstances. Vena cava filter: A filter placed inside a large vein (the vena cava) that blocks blood clots before they reach the lung, preventing pulmonary embolism. Get up and move, as soon as you can, after being bedridden for long periods because of injury, illness or surgery. If you’re at risk for deep vein thrombosis: 1) Wear compression stockings or other compression devices when needed, especially when hospitalized. 1) Take anticoagulants to prevent deep vein thrombosis. Check with your doctor. Maintain a healthy weight, exercise and follow your doctor’s specific recommendations. Try to walk around every two to three hours. Move your legs as you sit: 1) Raise, then lower, your heels as you keep your toes on the floor. 2) Raise, then lower, your toes as you keep your heels on the floor. Tighten, then release, your leg muscles.